Free Parking for Registered Hotel Guests.Stay in downtown Grand Rapids, Michigan at the Holiday Inn hotel for truly convenient accommodations! The hotel's thoughtful location in downtown Grand Rapids, Michigan is 15 miles from Gerald R. Ford International Airport (GRR), two blocks from DeVos Convention Center and within walking distance of top businesses.Ideally positioned in the heart of downtown Grand Rapids, Michigan, this hotel's property allows guests easy access to cultural sites, including Grand Rapids Art Museum (GRAM) and Gerald Ford Presidential Museum. Nearby entertainment venues like Van Andel Arena feature hockey games and big-name performers, while John Ball Park Zoo ensures family fun.Those seeking Grand Rapids, MI hotels with meeting space need look no further: we have nearly 1,300 sq ft of space for meetings, receptions and events for up to 120 guests. A business center, free Wi-Fi access and close proximity to such companies as Spectrum Health, Van Andel Research Institute, Varnum and Ernst & Young make our hotel a top choice among corporate guests visiting Grand Rapids, MI.Our hotel's amenities show we care about you and the environment, as we practice sustainable initiatives. We encourage you to relax in the indoor pool or whirlpool and utilize the convenient room service, on-site dining and convenience store. 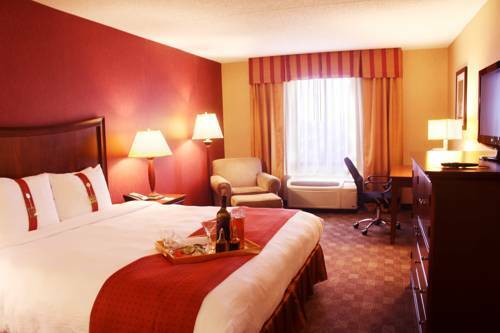 Let the Holiday Inn Grand Rapids, Michigan Downtown hotel's staff make you feel at home! Pearl Street Lounge: Pearl Street Lounge promises hotel patrons a place to unwind at the day's end. Nightly happy hour specials feature tasty signature cocktails, top-tier liquors, local brews and fine wines. Contemporary decor creates a trendy, conversational environment. Childrens's program - With the Grand Rapids Public Museum located next door and the Childrens Museum a short walk, there are childrens activities available year round in Grand Rapids. Just ask our Guest Service Team for more information. The Grand: The Grand meeting room offers over 1200 square feet of space for a variety of set up options. State of the art audio-visual services and our convenient, easily accessible location make it the perfect spot for your next event.